Great 70th birthday wishes can make your 70th birthday girl or boy feel amazing, no matter how he or she feels — good or bad — about getting older. Great is what you'll find right below...when it comes to 70th birthday messages. Each birthday verse on this page pays proper tribute to anyone who has lived through (and survived) seven decades of ups, downs, in-betweens and turning points. 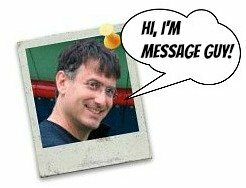 If, before venturing below, you think that you need some helpful hints to choose the right birthday verse for your loved ones, click here to check out Message Guy Tip #70. It will only take you a minute and may very well lead to the best 70th birthday messages you've ever chosen. Happy birthday! 70 may not really be the new 50 but it's definitely flirting with 60 (in more ways than one). Now that's something to celebrate! 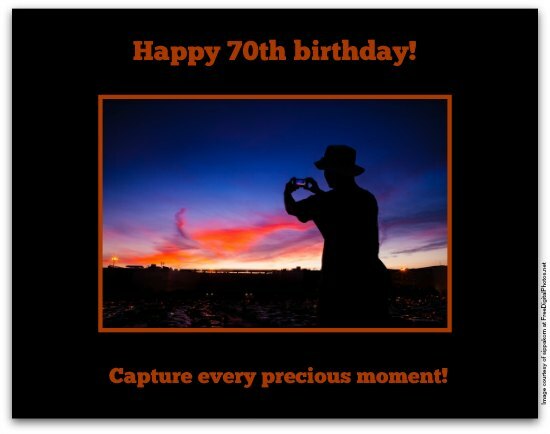 Wishing you the best life has to offer — and the stamina of a long-distance runner to enjoy it — on your 70th birthday. Happy 70th birthday! Don't look so glum— at least you're not 80. Happy birthday! You're not 70. 70 is a number. You can't put a number on someone as uniquely incredible as you! Happy 70th birthday! Calling you old is like calling love old. That's just silly. Have a terrific 70th birthday — you'll never be this young again. Happy 70th birthday! Life's long. Take chances. I think it’s incredible that it took only 70 years to create someone as young (at heart) as you. Happy 70th birthday! Happy birthday! You've always been cool. Now that you're 70, you're hotter than a sauna in the summertime. At 70, your love, kindness, integrity, courage and humility, once worth many times their weight in gold, are now priceless. Happy birthday! Nobody and nothing, not even Old Father Time, can come close to you — you're light years ahead of everyone and everything else. Happy 70th birthday! Happy birthday! You're the wealthiest 70 year old I know. You have a wealth of love, family and friends invested in your happiness and health. Happy birthday! At 70, you are an eight-course gourmet meal in a fast food world. Happy birthday! Although you have the energy of a 20 year old, the drive of a 30 year old, the joy of a 40 year old, the contentment of a 50 year old and the wisdom of a 60 year old, you are greater than the sum of your parts at 70.